We mixed everything but the nutmeg (we were out) together in a bowl. 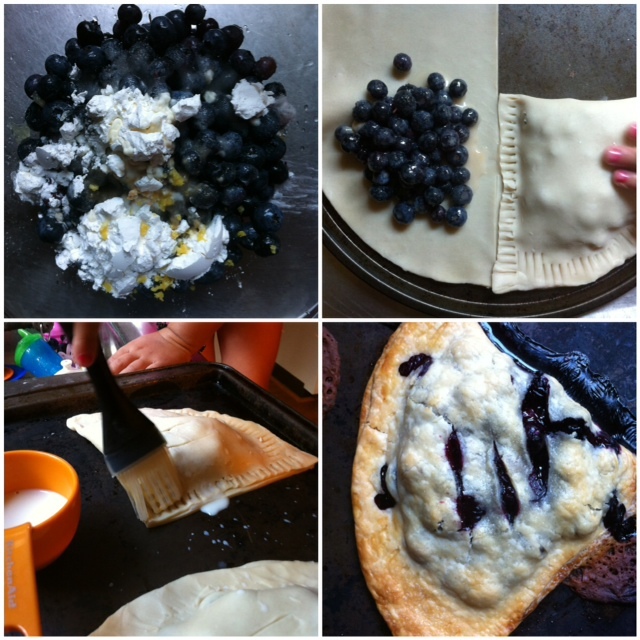 We then unrolled the pie crust and cut it in half with a knife. I spooned the mix into the center of the crust then showed the Bee how to close the edges with the back of a fork. She finished closing up the pies which was a job she took very seriously. After the pies were finished she brushed each pie with milk and we baked them in 375 degree oven for about 20 minutes. The came out so beautifully and the Bee was so excited for her dad to taste them. He of course loved them and not just because we made them for him. Even I had to admit they were pretty good, although they weren't chocolate. The finished pies were such a hit that I am thinking we will have to try them again and this time make the crust from scratch!